Hodie 1a vice lecta est Billa, intituled, "An Act for vesting the Manor of Goldborn, Part of the settled Estate of William Duke of Devonshire, in the County of Lancaster, in the said Duke and his Heirs; and for settling the Manor of Blackwall, in the County of Derby, in Lieu thereof, to the like Uses." E. Westmeath to amend his Appeal. 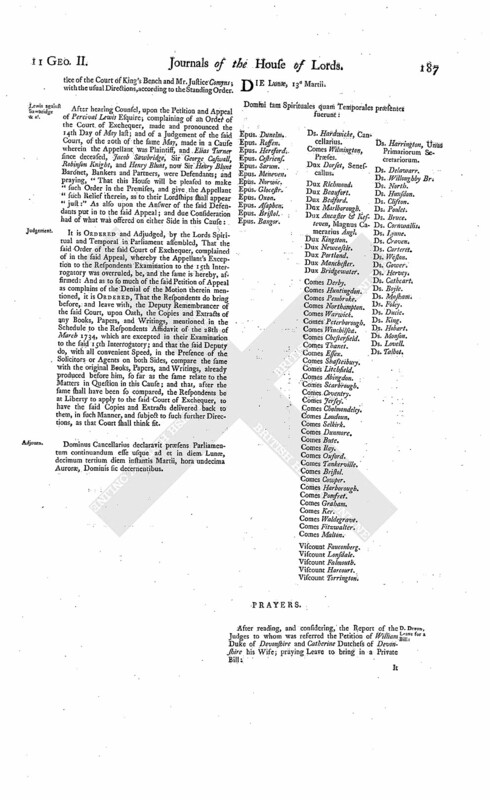 Upon reading the Petition of Thomas Earl of Westmeath; praying, "That he may be at Liberty to amend his Appeal depending in this House, by adding the Names of Silvester Reily, John Reily, and James Rogers, as Respondents thereto; and also to alter the Words therein, which mention that the Petitioner is entitled to Two Thirds of the Tithes and Composition in Lieu of Tithes in Question, into Words expressing that he is entitled to Four Ninths thereof; no Answer to the said Appeal being yet put in:"
It is Ordered, That the Petitioner have Leave to amend his said Appeal, in the Particulars desired. Hodie 2a vice lecta est Billa, intituled, "An Act to enable Sir Bryan Broughton Baronet, an Infant, to enter into Marriage Articles, concerning his intended Wife's Portion, notwithstanding his Infancy." Their Lordships, or any Five of them; to meet on Tuesday the 28th Day of this Instant March, at the usual Time and Place; and to adjourn as they please. Aberbrothock Duty on Beer, Bill. Hodie 2a vice lecta est Billa, intituled, "An Act for laying a Duty of Two Pennies Scots, or One Sixth Part of a Penny Sterling, upon every Scots Pint of Ale and Beer, that shall be brewed for Sale, brought into, vended, tapped, or sold, within the Town of Aberbrothock and Liberties thereof." Their Lordships, or any Five of them; to meet on on Wednesday next, at the usual Time and Place; and to adjourn as they please. Hodie 3a vice lecta est Billa, intituled, "An Act for naturalizing Abraham Blydensteyn." Sir W. Morice's Divorce Bill. But none appearing in Behalf of the said Lady Lucy, the said Bill was read a Second Time. And the First Counsel was heard at large, to open the Allegations thereof; and produced several Witnesses, who were sworn, and examined as to Familiarities which passed between Augustus Fitz Roy Esquire, commonly called Lord Augustus Fitz Roy, mentioned in the Preamble of the Bill, and the said Lady Lucy. And Mary Thomas, who had been the said Lady's Cook Maid, was likewise produced, sworn, and examined; and acquainted the House, "That, on the 13th of June last, in a House at Staines, in the County of Middlesex, she saw the said Lord Augustus and Lady Lucy in Bed together; and mentioned some Circumstances which happened on that Occasion;" but alleged, she could not remember what the said Lady Lucy might say to her the next Morning." Then Mary Lane, who kept the Post-office at Staines, informed the House, "That several Letters came to her House, from the said Lord Augustus, to the said Lady Lucy." As was also an authentic Copy of the Judgement given in the Court of King's Bench, at the Suit of the said Sir William Morice, against the said Lord Augustus; and likewise a Copy of a Definitive Sentence in the Consistory Court of the Bishop of London, for a Divorce. Dominus Cancellarius declaravit præsens Parliamentum continuandum esse usque ad et in diem Martis, decimum quartum diem instantis Martii, hora undecima Auroræ, Dominis sic decernentibus. Speen Mead, to enclose, Leave for a Bill. Book of Protests complained of, and Committee appointed. Ordered, That Mr. John Stagg and Mr. Joseph Fox, Booksellers in Westminster Hall, do attend the said Committee. Hodie 2a vice lecta est Billa, intituled, "An Act for vesting the Manor of Goldborn, Part of the settled Estate of William Duke of Devonshire, in the County of Lancaster, in the said Duke and his Heirs; and for settling the Manor of Blackwall, in the County of Derby, in Lieu thereof, to the like Uses." Their Lordships, or any Five of them; to meet on Wednesday the 29th of this Instant March, at the usual Time and Place; and to adjourn as they please. After some Time the House was resumed. Aberbrothock, Duty on Beer, Bill. 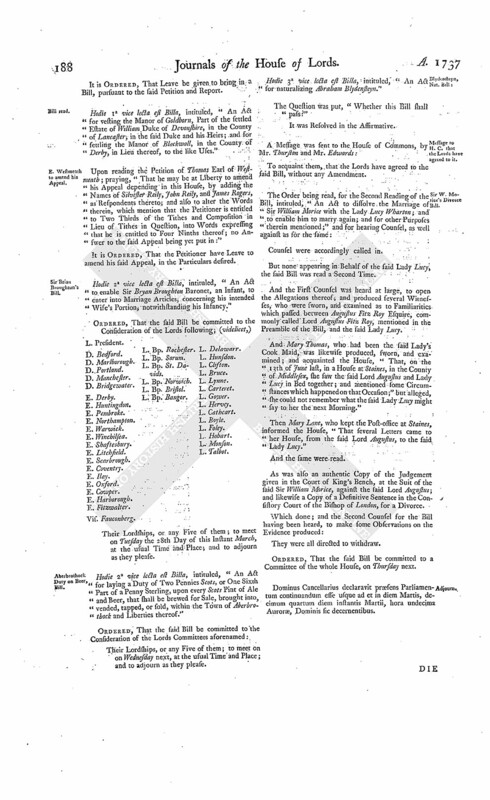 Ordered, That the Committee appointed to consider of the Bill, intituled, "An Act for laying a Duty of Two Pennies Scots, or One Sixth Part of a Penny Sterling, upon every Scots Pint of Ale or Beer, which shall be brewed for Sale, brought into, vended, tapped, or sold, within the Town of Aberbrothock, and Liberties thereof," which is directed to meet To-morrow, do meet on Thursday next. Dominus Cancellarius declaravit præsens Parliamentum continuandum esse usque ad et in diem Jovis, decimum sextum diem instantis Martii, hora undecima Auroræ, Dominis sic decernentibus. The Earl of Warwick reported from the Lords Committees to whom the Bill, intituled, "An Act for laying a Duty of Two Pennies Scots, or One Sixth Part of a Penny Sterling, upon every Scots Pint of Ale or Beer, which shall be brewed for Sale, brought into, vended, tapped, or sold, within the Town of Aberbrothock, and Liberties thereof," was committed: "That the Committee had considered the said Bill, and examined the Allegations thereof, which they found to be true; and that the Committee had gone through the Bill, and directed him to report the same to the House, without any Amendment." Symes & al. Petition referred to Judges. Ordered, That the Judges do attend this House on Tuesday next, at the Second Reading of the Bill, intituled, "An Act to explain and amend an Act passed in the First Year of the Reign of His late Majesty King George, intituled, An Act for holding the Assize for the County of Cornwal at a convenient Place within the said County." Byde & al. Petition referred to Judges. Dover and Rye Harbour, Bill. 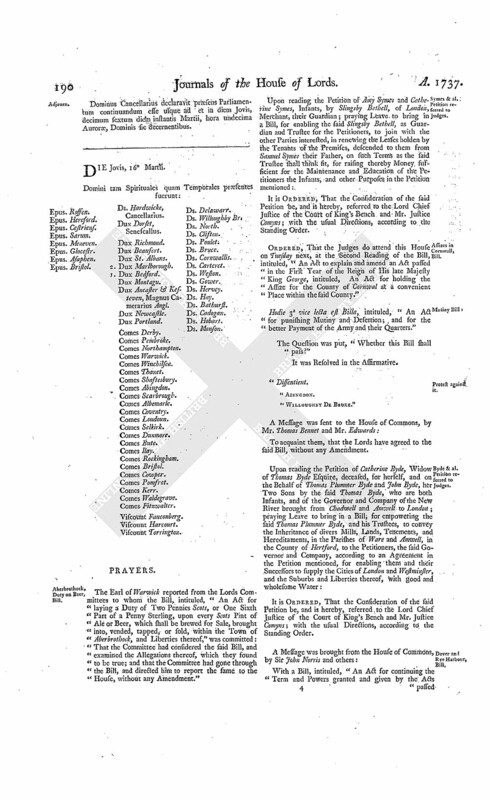 With a Bill, intituled, "An Act for continuing the Term and Powers granted and given by the Acts passed in the Eleventh and Twelfth Year of the Reign of King William the Third, and in the Ninth and Tenth Years of the Reign of His late Majesty King George, for repairing the Harbour of Dover, in the County of Kent; and for restoring the Harbour of Rye, in the County of Sussex, to its ancient Goodness;" to which they desire the Concurrence of this House. 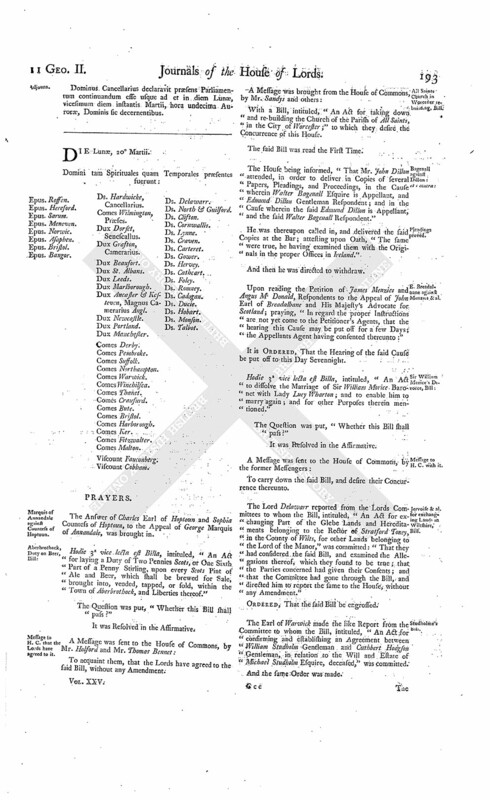 The House (according to Order) was adjourned during Pleasure, and put into a Committee upon the Bill, intituled, "An Act to dissolve the Marriage of Sir William Morice Baronet, with Lady Lucy Wharton; and to enable him to marry again; and for other Purposes therein mentioned:"
And the Lord Monson reported from the said Committee, "That they had gone through the Bill, and made some Amendments thereunto; which he was directed to report, when the House will please to receive the same." Dominus Cancellarius declaravit præsens Parliamentum continuandum esse usque ad et in diem Veneris, decimum septimum diem instantis Martii, hora undecima Auroræ, Dominis sic decernentibus. E. of Breadalbane against Menzies. Sir John Stewart against Craufurd. As was also the Answer of Patrick Craufurd Merchant, to the Appeal of Sir John Stewart and others. The House being moved, "That a Day may be appointed, for hearing the Cause wherein John Earl of Breadalbane and His Majesty's Advocate for Scotland are Appellants, and James Menzies and Angus McDonald Respondents:"
It is Ordered, That this House will hear the said Cause, by Counsel, at the Bar, on Wednesday next. Hodie 2a vice lecta est Billa, intituled, "An Act for continuing the Term and Powers granted and given by the Acts passed in the Eleventh and Twelfth Years of the Reign of King William the Third, and in the Ninth and Tenth Years of the Reign of His late Majesty King George, for repairing the Harbour of Dover, in the County of Kent; and for restoring the Harbour of Rye, in the County of Sussex, to its ancient Goodness." Sir Henry Goodrick & al. Petition referred to Judges. The Lord Delawarr reported from the Lords Committees appointed to examine into the printing and publishing a Book, intitled, "A complete Collection of Protests, from the Year 1641, to the present Year 1737," mentioned to be printed for W. Webb near Paternoster Row; and also to inquire who are the Printers and Publishers thereof: "That the Committee met Yesterday, pursuant to the Direction of the House; and were (according to their Lordships Order) attended by Joseph Fox, a Bookseller in Westminster Hall; who, being shewn the Book complained of, acknowledged that he bought the same of Mr. Cooper in Paternoster Row: Whereupon the Committee gave Directions for the Attendance of the said Cooper; who accordingly attended this Day, and, upon his being examined, owned that he was the Printer and Publisher of the said Book, and had the Profits of the same entirely to himself; but did not own from whom he had the Copy; but said, the Copy was sent to him from a Person unknown, with the Preface in a loose Sheet; and that the Reason why he did not put his Name to the said Book, as Printer thereof, was for Fear of giving Offence; and that he had about Fifty Copies of the said Book by him." Cooper to be attached, and Copies of the Book to be seized. Ordered, That the Gentleman Usher of the Black Rod, his Deputy or Deputies, do forthwith attach the Body of the said Mr. Cooper, and keep him in safe Custody till further Order of this House; and that the said Gentleman Usher do forthwith seize the several printed Copies of the said Book which are in the Possession of the said Cooper, and deliver the same into the Custody of the Clerk of this House; and this shall be a sufficient Warrant in that Behalf. To Sir Charles Dalton Knight, Gentleman Usher of the Black Rod attending this House, his Deputy or Deputies, and every of them. 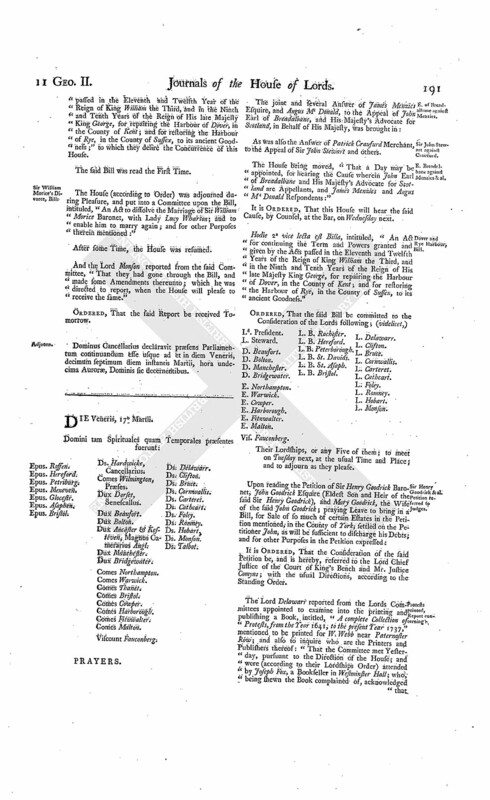 The Earl of Warwick presented to the House (pursuant to their Lordships Order of the 10th of February last) a Bill, intituled, "An Act for enclosing and dividing the Common Fields and Common Grounds, in the Manor and Parish of Binbrooke, in the County of Lincoln." With a Bill, intituled, "An Act for naturalizing Philip Rigail;" to which they desire the Concurrence of this House. 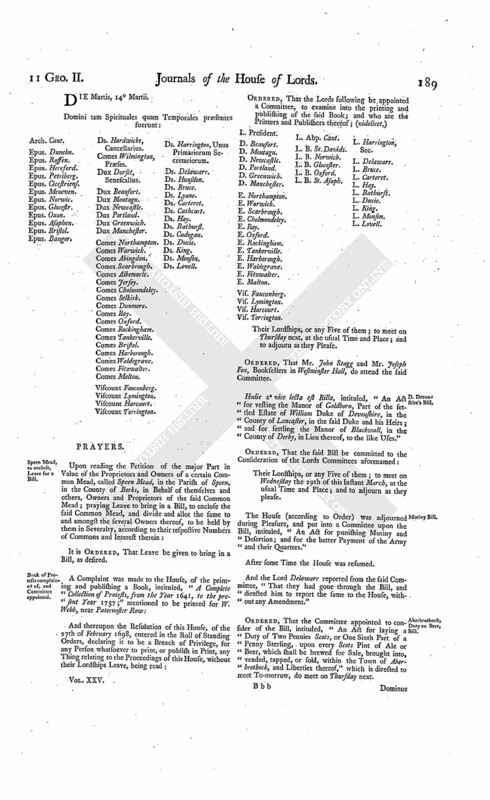 This Day being appointed, for hearing Counsel, upon the Petition and Appeal of Robert Moore Esquire, Packington Tomkins and Elizabeth his Wife, Rowland Berkeley Esquire, Eldest Son and Heir of Rowland Berkeley and Mary his Wife, both deceased, and also Executor of Rowland Berkeley, deceased, and George Guy; complaining of a Decree of Dismission, of the Court of Exchequer, of the 18th Day of May last, made in a Cause wherein the Appellants were Plaintiffs, and Simon Mitchell and Henry Byam Wood Defendants; and praying, "That the same may be reversed; and that the Respondents may be ordered specifically to perform certain Articles of Agreement in the Petition mentioned, bearing Date the 24th Day of August 1708; and that this House will give the Appellants such Relief as to their Lordships shall seem meet:"
The Appellants Counsel acquainted the House, "That the Parties were come to an Agreement, which was reduced into Writing, and signed by all the Parties, except the Respondent Henry Byam Wood, who had not put in any Answer to the said Appeal, and, as it appeared to the House, had assigned his Interest in the Matter in Question to the other Respondent, the said Simon Mitchell." And thereupon the said Agreement was read, at the Bar. And the Appellants Counsel having prayed, "That the same may be made the Order and Judgement of this House:"
The Parties were directed to withdraw. 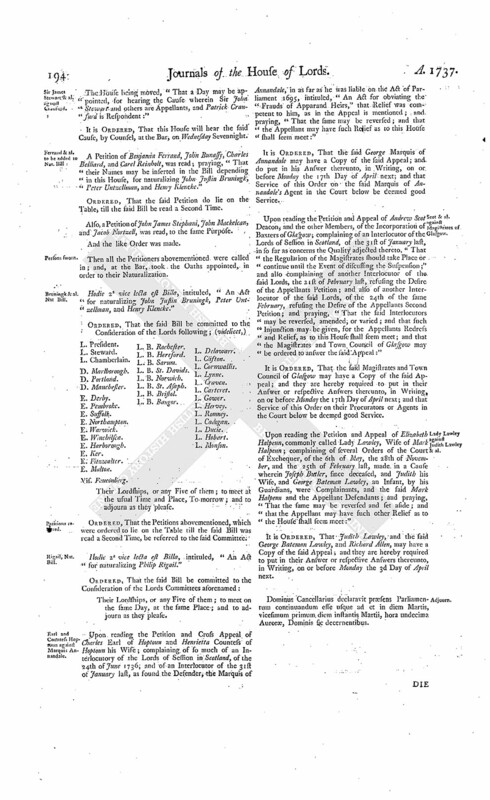 It is Ordered and Adjudged, by the Lords Spiritual and Temporal in Parliament assembled (according to the said written Agreement), That the said Decree complained of in the said Appeal be, and the same is hereby, reversed: And it is further Ordered, That the said Respondent Mitchell do, at the Costs and Charges of the Appellants, within Three Months after the Date hereof, convey and assure, and procure his Trustees to convey and assure, to the Appellants, their Heirs and Assigns, or as they shall direct, the Fee Simple and Inheritance of One Moiety of the Market in Spittlefields, in the County of Middlesex, and One Moiety of Two Thirds of the Market-place and Square of Spittlefields aforesaid, which belonged to Elizabeth Moore, now Elizabeth Hopkins, Wife of John Hopkins, and which have been conveyed to, or in Trust for, the said Respondent Mitchell, being the Premises in Question in this Cause, free from all Encumbrances done by the said Respondent, or his Trustees, or by the said Elizabeth Hopkins or her Husband, upon Payment by the Appellants, unto the said Respondent Mitchell, of the Sum of Two Thousand Pounds, with Interest for the same from this Day, at Four Pounds per Cent. and which Two Thousand Pounds is to be paid within the said Three Months, on executing such Conveyances, and is to be in full Satisfaction of all Claims and Demands whatsoever which the said Respondent Mitchell has or may have against the Appellants, or on the said Estate in Spittlefields, so to be conveyed as aforesaid; and that the Estate in Mortgage to the said Respondent Mitchell do stand a Security for the said Two Thousand Pounds and Interest, till the same shall be paid; and that, upon Payment thereof, the Respondent Mitchell shall, at the like Costs and Charges of the Appellants, assign the said Mortgage and mortgaged Premises to the Appellants, or to such Person or Persons as they shall direct, free from all Encumbrances done by him or by Charles Wood Esquire, deceased, or the Respondent Henry Byam Wood, or any claiming under them: And it is hereby further Ordered, That it be referred back to the said Court of Exchequer, to cause this Order and Judgement to be carried into Execution; and the Deputy Remembrancer to settle the Conveyances, if the Parties differ about the same. Sir William Morice's Divorce, Bill. Dominus Cancellarius declaravit præsens Parliamentum continuandum esse usque ad et in diem Lunæ, vicesimum diem instantis Martii, hora undecima Auroræ, Dominis sic decernentibus. Marquis of Annandale against Countess of Hoptoun. The Answer of Charles Earl of Hoptoun and Sophia Countess of Hoptoun, to the Appeal of George Marquis of Annandale, was brought in. Hodie 3a vice lecta est Billa, intituled, "An Act for laying a Duty of Two Pennies Scots, or One Sixth Part of a Penny Stirling, upon every Scots Pint of Ale and Beer, which shall be brewed for Sale, brought into, vended, tapped, or sold, within the Town of Aberbrothock, and Liberties thereof." All Saints Church in Worcester rebuilding, Bill. 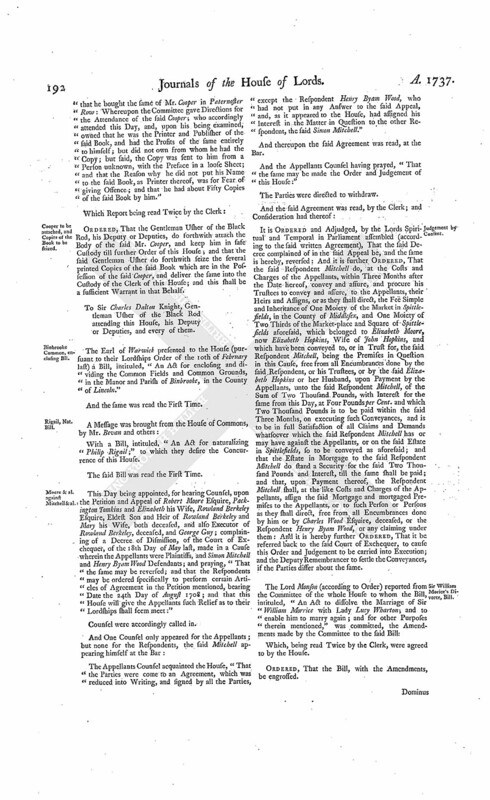 With a Bill, intituled, "An Act for taking down and re-building the Church of the Parish of All Saints, in the City of Worcester;" to which they desire the Concurrence of this House. The House being informed, "That Mr. John Dillon attended, in order to deliver in Copies of several Papers, Pleadings, and Proceedings, in the Cause wherein Walter Bagenall Esquire is Appellant, and Edmund Dillon Gentleman Respondent; and in the Cause wherein the said Edmund Dillon is Appellant, and the said Walter Bagenall Respondent." He was thereupon called in, and delivered the said Copies at the Bar; attesting upon Oath, "The same were true, he having examined them with the Originals in the proper Offices in Ireland." Upon reading the Petition of James Menzies and Angus McDonald, Respondents to the Appeal of John Earl of Breadalbane and His Majesty's Advocate for Scotland; praying, "In regard the proper Instructions are not yet come to the Petitioner's Agents, that the hearing this Cause may be put off for a few Days; the Appellants Agent having consented thereunto:"
Hodie 3a vice lecta est Billa, intituled, "An Act to dissolve the Marriage of Sir William Morice Baronet with Lady Lucy Wharton; and to enable him to marry again; and for other Purposes therein mentioned." Jervoise & al. for exchanging Lands in Wiltshire, Bill. The Lord Delawarr reported from the Lords Committees to whom the Bill, intituled, "An Act for exchanging Part of the Glebe Lands and Hereditaments belonging to the Rector of Stratford Toney, in the County of Wilts, for other Lands belonging to the Lord of the Manor," was committed: "That they had considered the said Bill, and examined the Allegations thereof, which they found to be true; that the Parties concerned had given their Consents; and that the Committee had gone through the Bill, and directed him to report the same to the House, without any Amendment." The Earl of Warwick made the like Report from the Committee to whom the Bill, intituled, "An Act for confirming and establishing an Agreement between William Studholm Gentleman and Cuthbert Hodgson Gentleman, in relation to the Will and Estate of Michael Studholm Esquire, deceased," was committed. Sir James Stewart & al. against Craufurd. The House being moved, "That a Day may be appointed, for hearing the Cause wherein Sir John Stewart and others are Appellants, and Patrick Craufurd is Respondent:"
A Petition of Benjamin Ferrand, John Bunassy, Charles Belliard, and Carel Reinholt, was read; praying, "That their Names may be inserted in the Bill depending in this House, for naturalizing John Justin Bruningk, Peter Untzellman, and Henry Klencke." Ordered, That the said Petition do lie on the Table, till the said Bill be read a Second Time. Also, a Petition of John James Stephani, John Mackelcan, and Jacob Nortzell, was read, to the same Purpose. Then all the Petitioners abovementioned were called in; and, at the Bar, took the Oaths appointed, in order to their Naturalization. Bruningk & al. Nat Bill. Hodie 2a vice lecta est Billa, intituled, "An Act for naturalizing John Justin Bruningk, Peter Untzellman, and Henry Klencke." L. B. Bangor. L. Delawarr. Ordered, That the Petitions abovementioned, which were ordered to lie on the Table till the said Bill was read a Second Time, be referred to the said Committee. Hodie 2a vice lecta est Billa, intituled, "An Act for naturalizing Philip Rigail." Earl and Countess Hoptoun against Marquis Annandale. Upon reading the Petition and Cross Appeal of Charles Earl of Hoptoun and Henrietta Countess of Hoptoun his Wife; complaining of so much of an Interlocutory of the Lords of Session in Scotland, of the 24th of June 1736; and of an Interlocutor of the 31st of January last, as found the Defender, the Marquis of Annandale, in as far as he was liable on the Act of Parliament 1695, intituled, "An Act for obviating the Frauds of Apparand Heirs," that Relief was competent to him, as in the Appeal is mentioned; and praying, "That the same may be reversed; and that the Appellant may have such Relief as to this House shall seem meet:"
It is Ordered, That the said George Marquis of Annandale may have a Copy of the said Appeal; and do put in his Answer thereunto, in Writing, on or before Monday the 17th Day of April next; and that Service of this Order on the said Marquis of Annandale's Agent in the Court below be deemed good Service. Upon reading the Petition and Appeal of Andrew Scot Deacon, and the other Members, of the Incorporation of Baxters of Glasgow; complaining of an Interlocutor of the Lords of Session in Scotland, of the 31st of January last, in so far as concerns the Quality adjected thereto, "That the Regulation of the Magistrates should take Place or continue until the Event of discussing the Suspension;" and also complaining of another Interlocutor of the said Lords, the 21st of February last, refusing the Desire of the Appellants Petition; and also of another Interlocutor of the said Lords, of the 24th of the same February, refusing the Desire of the Appellants Second Petition; and praying, "That the said Interlocutors may be reversed, amended; or varied; and that such Injunction may be given, for the Appellants Redress and Relief, as to this House shall seem meet; and that the Magistrates and Town Council of Glasgow may be ordered to answer the said Appeal:"
It is Ordered, That the said Magistrates and Town Council of Glasgow may have a Copy of the said Appeal; and they are hereby required to put in their Answer or respective Answers thereunto, in Writing, on or before Monday the 17th Day of April next; and that Service of this Order on their Procurators or Agents in the Court below be deemed good Service. Lady Lawley against Judith Lawley & al. Upon reading the Petition and Appeal of Elizabeth Halpenn, commonly called Lady Lawley, Wife of Mark Halpenn; complaining of several Orders of the Court of Exchequer, of the 6th of May, the 28th of November, and the 25th of February last, made in a Cause wherein Joseph Butler, since deceased, and Judith his Wife, and George Bateman Lawley, an Infant, by his Guardians, were Complainants, and the said Mark Halpenn and the Appellant Defendants; and praying, That the same may be reversed and set aside; and that the Appellant may have such other Relief as to the House shall seem meet:"
It is Ordered, That Judith Lawley, and the said George Bateman Lawley, and Richard Allen, may have a Copy of the said Appeal; and they are hereby required to put in their Answer or respective Answers thereunto, in Writing, on or before Monday the 3d Day of April next. Dominus Cancellarius declaravit præsens Parliamentum continuandum esse usque ad et in diem Martis, vicesimum primum diem instantis Martii, hora undecima Auroræ, Dominis sic decernentibus.